Shirt is in very good condition: little wear. SLEEVE LENGTH (from underarm): 14cm. Up for sale I have a gorgeouspink Polo Ralph Lauren Sport long sleeve shirt,Large in size. SLEEVE LENGTH (from underarm): 48cm. Elegant and Casual, Light Blue Custom Fit. POLO RALPH LAUREN MENS SHIRT SIZE M. Condition is New with tags. Sent with Australia Post Pre-Paid Parcel Post Satchel 500g. Up for sale I have a gorgeouslight blue Polo Ralph Lauren long sleeve shirt,Large in size. SLEEVE LENGTH (from underarm): 50cm. ARMPIT TO ARMPIT: 60cm. Polo Ralph Lauren Sp-Long Sleeve-Sport Shirt. Regular fit. 100% cotton. Button placket. In great condition Polo Ralph Lauren Men's T-Shirt Lot of 2. Condition is Pre-Owned. Sent with Australia Post Pre-Paid Parcel Post Satchel 500g. Shirt is in very good condition, like new. SLEEVE LENGTH (from underarm): 56cm. Underarm > underarm = 70 cm. Upper left front small pink stitched pony. Collared button down style. 100% blue and white striped cotton. 100% Authentic Polo Ralph Lauren Rugby Shirt. Washed & Clean. Shoulder seam to shoulder seam = 17.5". Shoulder seam to end of sleeve cuff = 24.5". Neck seam to bottom = 27.5". What you see in the photo is what you get. Size is a M. The shirt is pre-owned and is in very good condition. Raglan Sleeve 36". Size Large. Length 31". Size is a 15/38. The shirt is pre-owned and is in good condition. 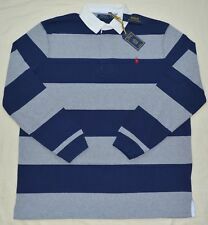 Polo Ralph Lauren Big & Tall Long Sleeve Rugby Polo [L]. Sent with Australia Post Pre-Paid Parcel Post Satchel 500g. This is a fantastic Ralph Lauren shirt in an excellent condition. Dark blue embroidered polo player on the front. Collar and full length buttons. Signature embroidered pony at the left chest. split yoke. There is a dark navy ribbed neck and sleeve cuffs. A little bit nautical and oh so wearable! Polo - Ralph Lauren (on woven back neck label). Sleeve length: 66cm. Length: 72.5cm (from neck to hem at centre back). Length : 32". No pick up. Signature colour embroidered pony at the left chest. split yoke. Length : 30". No pick up. Mens POLO BY RALPH LAUREN Casual/Dress/Formal Shirt - Size L. Off white colour. New. Tags removed to try on only. Sent with Australia Post Pre-Paid Parcel Post Satchel 500g.
" POLO RALPH LAUREN " LOGO DETAILS CAN BE SEEN AT THE LEFT CHEST AREA. THIS IS A LONG SLEEVES SHIRT WITH FRONT BUTTONED STYLE. SLEEVES : 65 CM. LENGTH : 78 CM ( FRONT ). Ralph Lauren. This shirt is made by Ralph Lauren, still in good condition. Length 69cm (27"). Material Cotton. Chest / Bust 53cm (21"). Inside Arm 53cm (21"). Condition good with 2 tiny marks. Inside Leg. That this shirt is original. 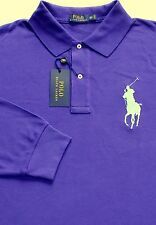 POLO BYRALPH LAUREN PURPLE SHIRT. LONG SLEEVED. SIZE: XXL. WITH BLACK POLO PONY ON CHEST. VERY GOOD CONDITION. 100% COTTON. Material: 100% Cotton. Colour: Red. SIZE 18 - XXL. Length - 81cm. Designer STUNNING Shirt SZ S. Dress to impress! Length 84 cm. MENS POLO RALPH LAUREN LONG-SLEEVE SHIRT. SIZE M. POSTBOY. BANDED COLLAR. Size L-XL (approx) - see sizing below. Stylish designer long sleeve button front shirt. Made from 100% cotton. Shoulder to hem- 79cm. U/arm to u/arm across- 64cm. Color - blue white plaid. navy blue embroidered pony logo on the chest. 100% cotton. Machine washable. Size Type Big & Tall. Material 100% Cotton. Color Blue. Sleeve Length Long Sleeve. Men's Ralph Lauren Polo Button Front Shirt. Size Small Light Purple (almost pink) and white striped. New with tags. Please see photos for measurements. 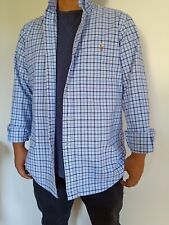 Mens Polo Ralph Lauren Long Sleeve Shirt Size XXL BNWT. Condition is New with tags. Sent with Australia Post Pre-Paid Parcel Post Satchel 500g.